Company's move to split into three units provides more freedom. 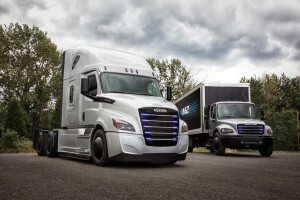 Daimler AG is splitting into three separate entities to improve efficiency and profitability. 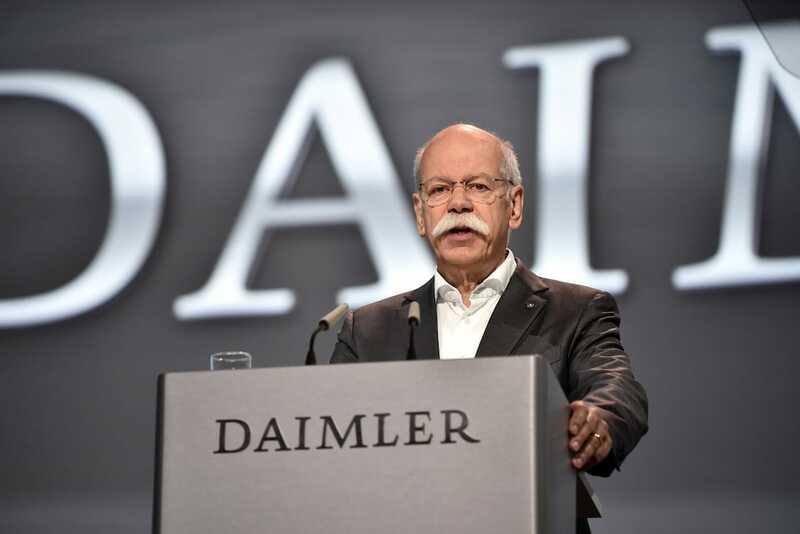 Daimler AG took another step toward a restructuring aimed at giving its three key operating units – cars, trucks and financial services – greater freedom and flexibility. The plan approved by the company’s supervisory board this week creates three new operating companies while the parent company, Daimler AG, retains oversight and governance, according to the company’s announcement. “The new structure positions Daimler to tackle the rapid pace of change in the mobility sector and the corresponding strategic challenges. Legally independent divisions will sharpen our focus on the future success of the business.” Manfred Bischoff, chairman of the Supervisory Board of Daimler AG. Under the new structure, Daimler plans to give its divisions more autonomy, position them even closer to their markets and customers, while empowering them to enter partnerships more easily and quickly. Following approval by the Board of Management and Supervisory Board the corporation can now move into the implementation phase of what it calls “Project Future,” Bischoff said. The steps toward implementation will be taken in 2018 and 2019 on the basis of clear business and technical criteria. The measures approved by the boards today require the final approval of the shareholders as a next step. The new structure will be voted on by shareholders at the company’s next annual meeting in 2019. The new Freightliner eCascadia and eM2 semis that are part of the efforts to lead the move into battery-electric semi trucks. In April, Bischoff told shareholders the company was following a deliberate and cautious approach as it restructures. Once the new structure has been fully implemented, which is expected to be at the end of next March, the Mercedes-Benz Cars & Vans division, under the leadership of Mercedes-Benz AG, will have around 175,000 employees worldwide, while the Daimler Trucks & Buses division, under the leadership of Daimler Truck AG, will have around 100,000 employees worldwide. Already legally independent, Daimler Financial Services AG will be called Daimler Mobility AG in the future. With nearly 13,000 employees, the division already absorbed responsibility for mobility services. The divisions will give the Daimler Group a more flexible and focused structure, company officials said. The operation of the businesses of Mercedes-Benz Cars & Vans and Daimler Trucks & Buses will be transferred to the new legal entities, which will then operate as strong divisions with a clear focus, independent corporate responsibility and higher potential for value creation. They will be able to enter even more focused cooperative ventures and partnerships. All three companies will be German co-determined stock corporations, “Aktiengesellschaften,”based in Stuttgart, Daimler officials said. 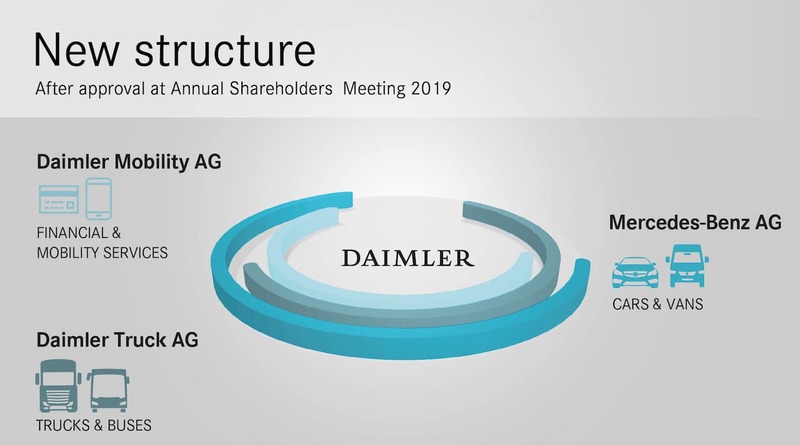 Daimler AG, the parent company, will exercise corporate governance, strategy and management functions and provide cross-divisional business services, ensuring that synergies between the three companies remain in place. 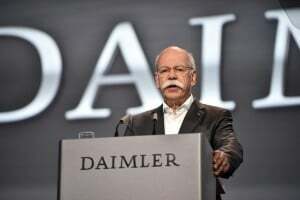 Daimler AG's Dieter Zetsche continues to push for innovation in the company's automotive and vans unit, Mercedes-Benz AG. As an operational holding company, responsibility for the funding of the entire group will continue to lie with Daimler AG, as the only company in the corporate group to be listed on the stock exchange. There are no plans for the corporation to divest individual divisions. In order to win the consent of employee unions, Daimler AG has agreed to a series of employment guarantees as part of the plan. “We have secured a reconciliation of interests that is unprecedented in Germany,” said Michael Brecht, deputy chairman of the Supervisory Board and Chairman of the General Works Council. “The job guarantee through the end of 2029 is an important signal for safeguarding our jobs in Germany. Having negotiated the right to co-determine the vertical scope of manufacture we have, for the first time, the opportunity to have a say on new investments and the question of in-house production versus outsourcing,” Brecht added. “Project Future is the consistent continuation of our strategy. We are reshaping our organization to put Daimler in the best position for the future: technologically, culturally – as well as structurally,” said Dieter Zetsche, chairman of the Board of Management of Daimler AG and Head of Mercedes-Benz Cars. At the heart of all these changes are the needs of our customers around the world: With the new structure we will be able to offer them mobility solutions even better tailored to their needs,” he said. This entry was posted on Thursday, July 26th, 2018 at and is filed under Asia Pacific, Automakers, Automobiles, Business, China, Daimler, Europe, Executives, Luxury Vehicles, Markets, Mercedes, NAFTA, Personalities, Sales, South America, U.S./North America. You can follow any responses to this entry through the RSS 2.0 feed. Both comments and pings are currently closed.